Welcome to Essex Yacht Sales! AN UPTOWN GIRL'S FORMER DOWN EASTER FINDS A HAPPY HOME IN ESSEX, CONNECTICUT. The look is Down East, with a tall bow and sweeping sheer line, a traditional trunk cabin with eyebrow trim and an upright, open-sided wheelhouse. But this lobster boat hull is something else: a particular shade of blue that’s at once distinctive and alluring. Sweet Freedom is a boat of a different color. Despite having sat on the hard for a few years, Sweet Freedom was in good shape, needing only a good cleanup and the cosmetic work one might expect after a layoff. (Brinkley reportedly paid to maintain the boat while it was in storage.) The 440-hp Yanmar CXM-ETE turbo diesel had less than 200 hours on it, and the boat has four high-end Stidd seats, including an electronically adjustable helm chair. Sweet Freedom was taken to Chester Point Marina on the river, where the brightwork was rejuvenated, new canvas was installed and the engine was serviced. Quarrier was right when she called Sweet Freedom the perfect boat for her clients. It’s big enough for jaunts to Block Island, Rhode Island, and Montauk, New York, or a weekend run across Long Island Sound for lunch at Claudio’s in Greenport, New York. Cruising speed is around 20 mph, and the top end is just under 30 mph. The wheelhouse can be closed in foul weather, and there’s a small galley and an enclosed head. With her Down East look, Bikini Blue color and celebrity past, Sweet Freedom is a package that pleases, says Klewin. And does he ever think, while enjoying a sunset cruise or a Sunday ride over to Greenport, about Christie Brinkley, who conceived of Sweet Freedom and guided its creation? Only rarely, he says. 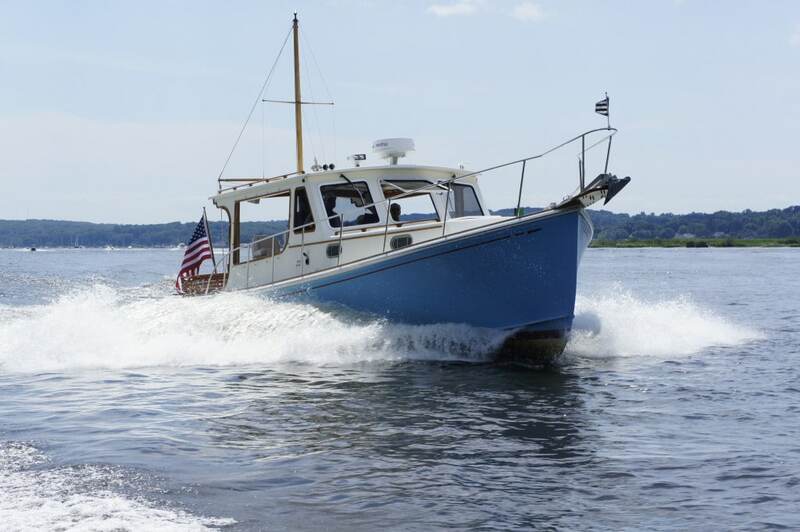 Feb 7: The Connecticut Spring Boat Show will take place at Essex Island, Essex, CT from May 3-5, 2019. Join us! November 24: Just listing a rare and very special Uniesse 48′, 1998. In the Essex CT area. September 13-16, 2018: Newport Boat Show and Brokerage Show – see us in Newport! April 30, 2018: Just listed a beautiful Grand Banks 42 Classic, 1986. 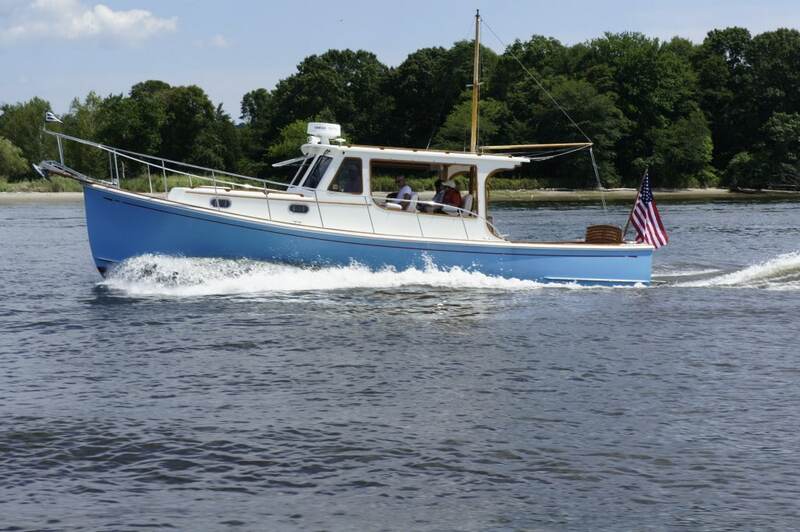 See her at the CT Spring Boat Show , Essex Island, May 4-6. February 26, 2018: Started the year really well, with excellent sales in February, despite the weather – we predict a very good season. Brokerage prices are strong, so this is the perfect time for Essex Yacht Sales to list your boat, with good exposure at the upcoming CT in-water Spring Boat Show and comprehensive marketing. December 23, 2017: We have passed the shortest day (!) and are already seeing stirrings that 2018 will be an exceptional year for boat sales. Meanwhile we wish our many clients and friends a very Merry Christmas, Happy Holidays and best wishes for a healthy and prosperous New Year. November 1-5, 2017: Let us know if you will be visiting the Fort Lauderdale International Boat Show (FLIBS). See us at the Nimbus display. September 28-30, 2017: TrawlerFest, Bay Bridge Marina, Stevensville, MD – see us there. September 21-24, 2017: Norwalk Boat Show – see us in Norwalk. August 13, 2017: The brokerage market is very hot right now, so this would be an excellent time to list your boat with Essex Yacht Sales. June 2 and 3, 2017: Mystic Seaport hosts an Eastbay Rendezvous. March 23-26, 2017: Join Essex Yacht Sales at the Palm Beach International Boat Show to view the Nimbus 305, 34 Nova and 405 Flybridge at the Palm Beach International Boat Show. February 24, 2017: 68F today! The buyers are coming, the phones are ringing. List your boat now! We are very active showing boats and getting strong offers. February 4, 2017: Spring is coming soon! We are preparing for Boat Shows, listing boats, showing boats, and getting offers. Watch for several exciting new listings this week! The market is hot, and good boats are in demand, so call Essex Yacht Sales today. November 19, 2016: Boat sales activity continues, with strong accepted offers in November. Buyers are seeking good quality brokerage boats, which are in short supply. Now is a great time to list your boat with Essex Yacht Sales, or engage us to find that special boat for you (no fee to buyers). November 8, 2016: Essex Yacht Sales has been appointed Strategic Sales Partner to Delta Powerboats. Essex Yacht Sales is excited to present the exciting and innovative range of boats and motoryachts from Delta Powerboats, from 26′ to 88′. November 5, 2016: Please call us about listing your boat. We are seeing strong buying activity from the west coast and south-east, where the boating season continues year round. Certain US brands of new boat are not keeping up with demand, This drives a strong market for well-maintained, quality boats, available, immediately. This is a great time to list your boat. October 8, 2016: Three surveys in the space of 7 days, 3 showings just today tells us that the market is very active. We are seeing buyers from the South-East and West Coast. It is a great time to list your boat with Essex Yacht Sales. A quick fall sale can save you the cost of hauling, winterizing and storing. July 24, 2016: See us at the Newport Brokerage Show (in association with the Newport International Boat Show), Sept 15-18, 2016. Find out how we can work with you on a direct, personal level to meet your buying or selling needs.